Happy Start-of-Surface day. You may have read earlier that Microsoft has leaked pricing of its Surface RT tablet but the company has finally made it official. Oh, and at 9am PT, you can pre-order the device direct from the Microsoft Store. The device will start at a cool $499 for the basic tablet with 32-gigabytes of internal storage. For those of you keeping price score, that’s $100 less than Apple charges for the current generation iPad with the same storage capacity. If you want one of the nifty ‘Touch Cover’ cases that doubles as a keyboard and touchpad, you will need to pay $599 for your device. As you will certainly note, we all but nailed that pricing. A quick opinion poll among TNW staffers is that such a price point is not only feasible, but somewhat enticing, with one of our staff members noting that he hasn’t bought a Microsoft product since time immemorial, but is tempted by the Surface. You may interpret that as you will. Microsoft has already published prices for its German customers; it will cost €479 for 32GB minus a Touch Cover cover, €579 with the cover and €679 for a 64GB model (which also ships with a Touch Cover). TNW was on site yesterday in Studio B with the Microsoft Surface team. Notes from that visit along with other informational pieces will be released in the future, once the embargo hangover of a complicated launch becomes less hard to parse. We have more coming, essentially. In a short conversation on a staircase with Microsoft’s Steven Sinofsky – if you don’t know that name, to a search engine with you! – he stressed that pricing was something that, in his view, was almost overstressed, noting that comparing the price of various products without taking into account their merits and capabilities is a bit of an fool’s errand – and I paraphrase, naturally. The Surface RT is a very highly designed device, with care paid to every inch of its construction. I held today one of the very first cardboard, notepaper, and tape mockups of its early days. It’s from the ground up, in a very real way. The Surface is a mix of tablet and laptop, but not in the sense of finding yourself constantly torn between either form factor; just as Windows 8 is to be both touch and mouse and desktop and mobile operating system, so too is the Surface a number of things all at once. We cannot comment too heavily, but the Surface tablet is by far the best attempt at translating Windows 8 to hardware that we have seen thus far. 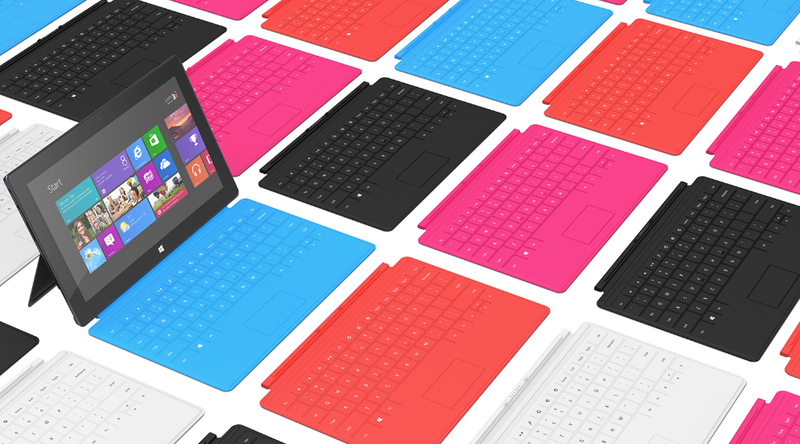 The Surface is price competitive with the iPad. It is more expensive than smaller Android tablets. However, it comes with both Windows 8 and the Office 2013 suite – not a final build yet, mind you. Could it have been cheaper? Yes. However, Sinofsky noted that the device is not a loss-leader. He went on to describe the device as a business unto itself. And finally, this OEM game that Microsoft is playing is no mere skirmish. Given the ample resources and deep attention to detail that the company has slavered onto the Surface device, it is plain: this device is meant to sell. If you want a Windows 8 experience that provides the highest level of hardware and software fit, this is probably it.